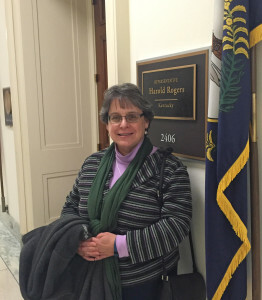 This interview was conducted with Sister Robbie Pentecost, OSF by Sarah Spengeman, NETWORK Grassroots Mobilization Manager following the Sisters in Public Leadership training in Washington, D.C. on Marc h 3-4, 2016. Q: Sister Robbie, why do you think Catholic sisters are such a powerful voice for justice? A: Catholic Sisters are seen as people of integrity, faithful to the Gospel. Society does not see us seeking power for ourselves, but rather using our power to lift up the poor and marginalized. Our way of life, as seen by others, is consistent with who we say we are and we are passionate about making a difference in the life of others. Thus, we are seen as a trusted source without a hidden agenda. People listen! Q: How did being a Nun on the Bus prepare you for the leadership training? 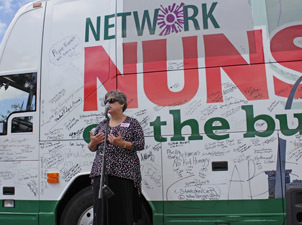 A: Being a Nun on the Bus provided a practical context for the leadership training. On the Bus you must be ready for anything, particularly challenging questions and comments that may divert from the core purpose of the Bus. Prior to actually getting on the Bus, sisters are given a mini preparation on how to stay focused and to respond to interview questions. However, this day and a half of leadership training was far more in-depth and provided a broad landscape to use these tools. Q: What was the most surprising part of the training? A: Perhaps the biggest surprise of the training was in discovering the vast network of resources available to people of faith who want to advocate for justice issues. Faith in the Public Life staff, along with NETWORK and a host of other groups have materials on many current justice concerns that they are more than willing to share and will help in the research as well. But more amazing is their willingness to practice with you and help you prepare to advocate. Q: What was the most valuable skill you learned or developed? A: Staying focused on the core message that you are trying to get across and telling a story in a concise way to hit home the core message. Remaining focused in an environment that may be rather hostile can be challenging, but staying rooted in why you are doing what you are doing and not seeing those who disagree with you as the enemy helps to keep you focused. You don’t have to know answers to everything that comes your way. Speaking your truth, as you understand it, is an effective method of communication. Perhaps an even more valuable learning was how essential meditation and prayer are to effective advocacy. Q: How do you plan to use these skills in your work for justice? A: My current ministry, as the Coordinator of Donor Relations for my Congregation, is not necessarily seen as a direct advocacy role. However – mission should be at the forefront of our work in Advancement and we should seize upon opportunities to speak with donors or the public about the values our Congregations hold. Justice is at the heart of our mission and thus speaking about justice and why the Sisters are passionate about many issues facing our world today can engage our donors, as well, in furthering our mission. Often times we let fear keep us from speaking about issues of justice, fearing the loss of donations. The ability to engage donors on issues of justice, without alienating them, is critical to the work of our Congregational Advancement offices and this training helped me develop and hone these skills. Q: What advice would you give other sisters and/or other people who want to advocate for social change? A: Trust your heart and just do it! But preparation and practice are vital steps in the process. Stepping beyond our fear of disagreeing with another or concern about what others may think of us is part of our faith journey. When we develop an ability to offer another perspective without disregarding the other person’s perspective, there is a sense of freedom. Advocating for social change, even though a rather slow process, brings a sense of renewed energy. It is also about building community, recognizing we cannot reach the Kingdom of God alone. This entry was posted in Front Page on March 11, 2016 by networklobby.